Okay, Portlandia, before we get into “Soft Opening”—a weaker episode than usual but still with a few high points—I think we need to have a talk about your use of cartoon sound effects. Yes, I understand that you’re a show that practices a loose relationship with reality, and that said relationship allows you to get away with more surreal twists to stories that are funnier more often than not. But really, it’s getting out of hand. You built an entire opening sketch of a young boy making a Rube Goldberg device and seemed to know from the start it was aimless and unamusing, and you seemed to think that adding an old-timey piano and a few bells and whistles would make it funny. And it didn’t. And it wasn’t just limited to the open. Over the course of this episode you abused the sound of car horns, xylophones, breaking glass, and someone imitating power tool noises with their mouths, and every time you did it it took me out of the action. I’m not saying you need to stop using them, but you need to remember that your sketches succeed based partly on gradually breaking down your world’s pleasant hipster facade to reveal the insanity that lies underneath, rather than reminding the viewer that they’re watching something wacky. Indeed, it’s the gradual erosion of sanity that keeps the narrative sketch moving so well. The bed and breakfast that was conceived in “Bring Back MTV” and certified in “Off The Grid” has now come to life as The Quilted Tea Kettle Inn, and Peter and Nance are beside themselves with joy to present their creation to the world. They invite a few local couples—food truck proprietors Stu and Donald from “Winter In Portlandia,” Mr. and Mrs. Ronald D. Moore from “One Moore Episode”—over for a “soft opening” where they go through a trial run of the B&B’s features. Of which there are a lot, as the brochure promises such delights as a “jalopy ride” through town, a couples’ massage, and wine and cheese at 4. All of which were thrown into the brochure on Peter’s suggestion, with the rationale that they’d look good and no one’s ever going to ask for those things. As Bob’s Burgers proved early in its run, trying to deliver a B&B experience turns people crazy, and when those people are already tightly-wound neurotics, it’s even better. Peter and Nance are one of Portlandia’s most fleshed-out couples, and the act of trying to please this many people at once gives a nice progression: first obsessing over little things like spend all night folding towels into animals, then giving into their anger by cursing and ranting at each other trying to put breakfast together, and then the tight forced smiles as the visiting couples ask for the next feature. And speaking of sound effects, there’s plenty of evidence in this sketch that the show can be funny when it’s silent, be it Fred Armisen pantomiming his hand towel animal creations or Carrie Brownstein flashing some leg to get some help when the jalopy breaks down. What sells the sketch is the closing act, when the two finally break down and admit that they don’t know the first thing about running a bed and breakfast, and the guests admit that they liked all of the imperfections. (Matt Lucas in particular is a delight throughout the whole sketch: “The vomiting that followed the breakfast was part of it! 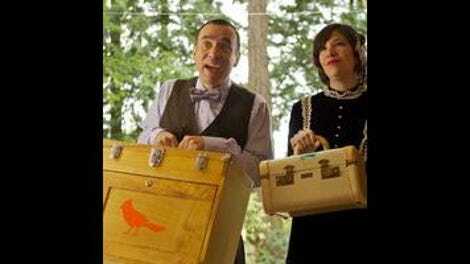 It was like a cleansing.”) Portlandia features a lot of strange people, but it’s also a show that has a clear affection for its weirdos, and as long as their intentions are good, it wants to hand out an A for effort. But as is so often the case on Portlandia, the Platonic ideal is far removed from the reality, as Caleb’s furniture is pretty terrible. (And yet still wonderfully Portland, as it includes a vest rack and “a lavatory vanity box.) The disbelieving looks from the magazine staff sell this one, as does Armisen’s weak defense of how the furniture’s not quite finished yet. Plus, there’s another great bit of physical comedy as Caleb is utterly incapable of keeping his balance on the rickety chair. Another poorly conceived idea is nestled in the adventures of a Portland steampunk convention, based out of one hotel room in the Double Tree Hotel. The convention’s organizers decide that their grand adventure will be to “rescue” someone who hasn’t come to the convention this year, staging an invasion of a fan fiction workshop. There’s plenty of fun moving pieces in this one, as they don’t even try to get into steampunk culture or mythos, opting instead to fixate on such things as the necessity to cross your fingers in order to shift out of your personas of Captain D.D. Cumulus and Lady Opal Nightstream, or the irritations of members who don’t stop firing their toy guns or turning on their hat-lights. Plus, it lets both Armisen and Brownstein make grandiose speeches in increasingly florid tones, adding another layer to the pretension both are so good at bringing across. And then there’s Fred, who’s decided on the spur of the moment to fly his girlfriend of three dates out to Italy—a decision that is justly greeted with skeptical glances from Carrie and Alexandra. This sketch depends on your fondness for awkward relationship comedy, as the couple serve as poster children for why international travel should be planned in advance. First she refuses to sleep on the plane, then there’s confusion about the design of the hotel restroom (“Maybe you stand on the toilet to go to the shower”) and then the jet lag leads them to sleep through an entire day, and therefore the entire trip because Fred only booked it for a single day. What makes it all the funnier is that Fred’s not doing this because he’s trying to get laid (though he makes a few half-hearted attempts) or because he’s trying to be a romantic, it’s just an idea he had that he didn’t think about, as his sheepish admission that the whole venture cost him $6,000 demonstrates. “What is wrong with you? !” his soon-to-be-ex-girlfriend yells in a too-infrequent moment of someone calling these characters out, too confused by the turn of events to even be mad. And this lets Portlandia grant us a philosophical moment, as Carrie and Alexandra scroll through Fred’s endless album of phone portraits taken at all the exciting places he went to, from the plane to the hotel room to the customs lane. “Everyone on the Internet, they’re not having as great a time as you think they are,” Fred wearily says. “I guess people are just cropping out all the sadness,” Carrie muses to herself. Yes Ms. Brownstein, yes we are. The obsessive regard Portlandia’s residents hold for people who make their own furniture is a clear sign that Nick Offerman needs to be a guest star in a hypothetical fourth season. “Real life is stranger than fan fiction.” Clearly this workshop moderator has never read my Buffy the Vampire Slayer/Deadwood crossover story set in the Pirates of the Caribbean universe. The fifth chapter even has a cameo from cyborg time-traveling Don Draper!